Showing no loot on my warrior - when dungeon journal lists loot that i haven't learned yet (in fact, i just unlocked something from boss drop). Small marker if im already saved to instance would be helpful. Hard to remember all lockouts when farming with several characters. get SavedInstances addon, its great! 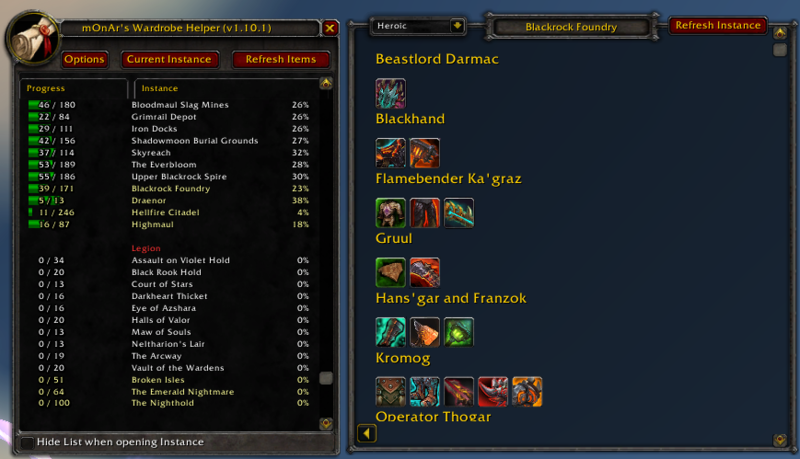 It is nice addon, but it doesnt remove the need to crossreference while using helper. Small marker next to names in helper would do that. Or option to remove saved instances from list would be even better. Will see what I can do, at least for raids. I just wanted to say thank you very much for this addon. 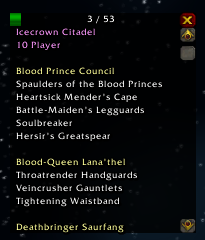 I'm getting tired of Blizzard having multiple names for everything. Thank you for the helpful report. I've noticed something strange. When I enable this addon TomTom's options are breaking. Whenever I choose any tab, it appears empty. With WardrobeHelper disabled they work fine. Do you have version 1.5.3+? it is autorefresh my base? can i turn off it? hehe i bet you have "Can I Mog It?" right ? cause that one got this problem. Could you please include Zone drops in the lists?